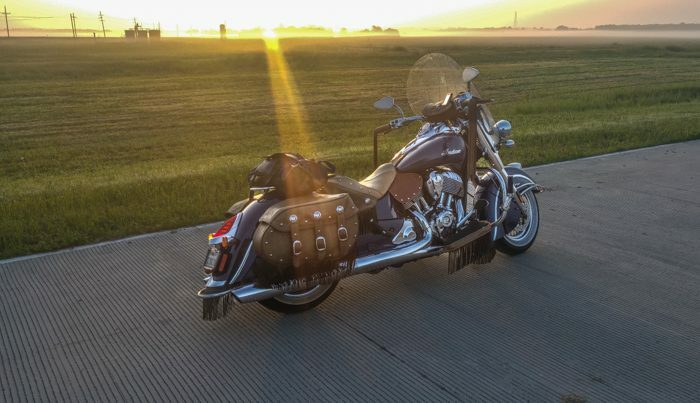 Sure enough, in late April, me and my 2014 Indian Chief showed up at Nathan’s door early one morning, all prepared to hit the road. 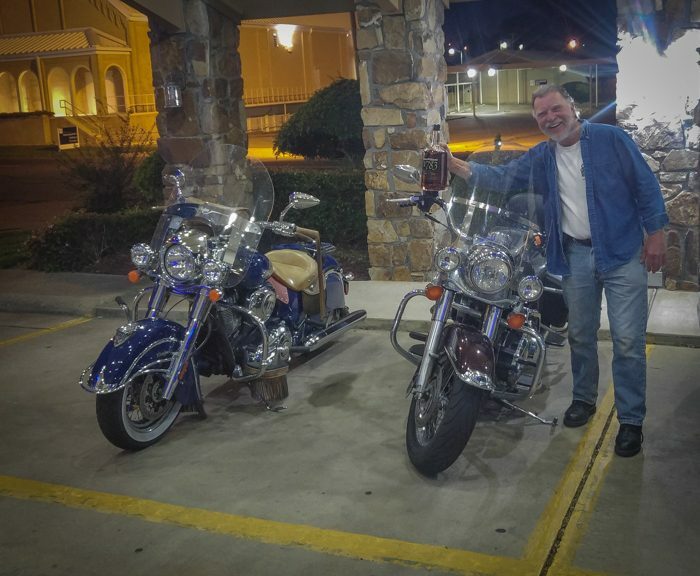 We wouldn’t need any maps (I attached my GPS to the handlebar anyway, just to “monitor” our progress), as our route would follow US Highway 79 all the way from Round Rock to Humboldt. Many people don’t realize that Hwy 79 actually begins in Round Rock, Texas and continues unbroken all the way up into Kentucky. It is one of the more beautiful roads through Texas, boasting well-maintained pavement and light traffic. 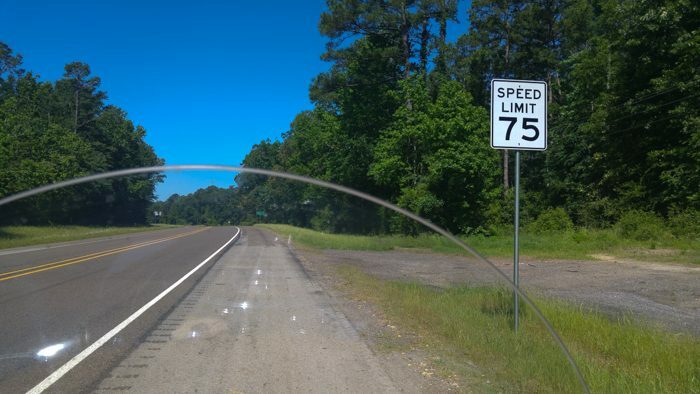 And, due to its length, could almost be recognized as the North-South equivalent of Route 66. Once arriving in Humboldt, the plan was that Nathan would stay on with family for a few days, while I would motor solo on south to Leeds, Alabama (an outlier of Birmingham) to visit the renowned Barber Vintage Motorsports Museum, home to one of the largest collections of motorcycles in the world (over 1,400 bikes according to the museum). 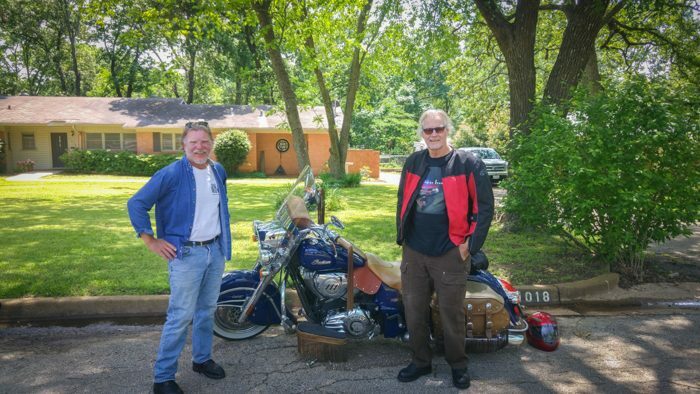 Anyone desiring to get a realistic glimpse of small-town mid-America would be well-served to take a trip along Highway 79. There is a certain common rural identity to each of these small towns along the way. Most still exhibit the remains of more prosperous days.. times when the economy was mostly agrarian, and there was a necessity of villages situated within a day’s buggy ride. Now, paved highways, modern vehicles, and online shopping have all conspired to decimate these once-thriving economies, leaving little remaining evidence of civilization other than the ubiquitous small-town icon “Dollar Store”, accompanied almost certainly with a matching “Family Dollar Store”, both generally within walking distance of each other! The evidence of dashed hopes and unrealized dreams are visible everywhere. For example, one has to wonder what spark of entrepreneurial brilliance would have convinced someone that opening a drive-through “hot wings” joint in a village of 600 people could ever qualify as a sound business plan? But then of course, there is never a shortage of churches, not only within the villages, but dotted liberally along otherwise-uninhabited country roads, most all seemingly still in current operation. No municipality with a population under 1,500 people should be allowed to post speed limits less than 45 mph. It was during one such break that we both vowed to do our part in correcting the apparent inequity in church/bar ratios by frequenting MORE bars and LESS churches. 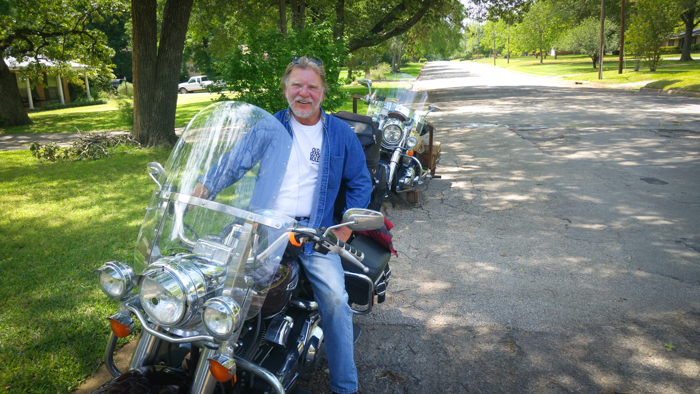 Riding a motorcycle on a cross-country trip provides an opportunity for personal reflection and introspection. An opportunity that is otherwise rare in our information/entertainment-laden modern day environment. There is no distracting radio (if you are smart), and the pure process of remaining alive requires all the senses to be focused on the road. Where have all the ‘C’s gone in Texas (Koffee Kup.. Kountry Kitchen.. Korner Kupboard.. Kozy Korner).. Who says phonetics is dead? 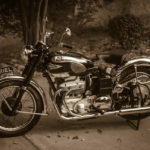 The ultimate (and most appropriate) question to ponder when on a bike, though, has to be: Why does man ride motorcycles? And, my guess is that you could ask 100 riders, and get 100 different answers. After all, why would a guy choose to brave sun, wind, and water, when the same destination could be reached at the same time in the comfort of one’s enclosed, air conditioned vehicle. For me, it all revolves around the old maxim “It’s the JOURNEY, not the DESTINATION”. 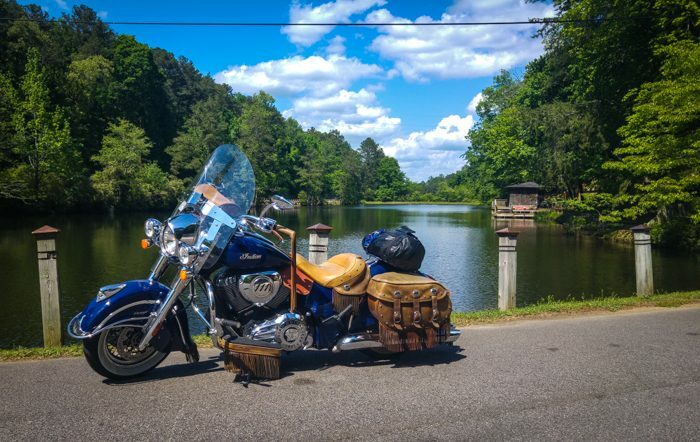 When a man chooses a bike for a trip, it is expressly to appreciate the wonders of the journey, while the intended destination becomes factor of much lesser consideration. On a bike, the choice of routes will likely be those back roads which avoid the freeways, and afford a close up examination of inner America. But then, the pure exhilaration of man intimately connected to machine shouldn’t be ignored. Many riders liken being on a bike as the closest thing to flying while still remaining earth bound. The personal satisfaction of executing a smoothly performed gear shift; the joy of leaning the bike into the corner; the near 360 degree unobstructed views; and the ability to stop and park instantly when a roadside element or attraction beckons. Yes, it’s all these and more that keep returning me to the saddle! The route from Central Texas to Tennessee offers a wide variety of terrain and vegetation. The rugged Hill Country quickly gives way to black-dirted farm land just as soon as the “border” (I35) is crossed. Then, in short order, flat farm land makes a transition to green leafy woods (so long Cedar and Mesquite trees). 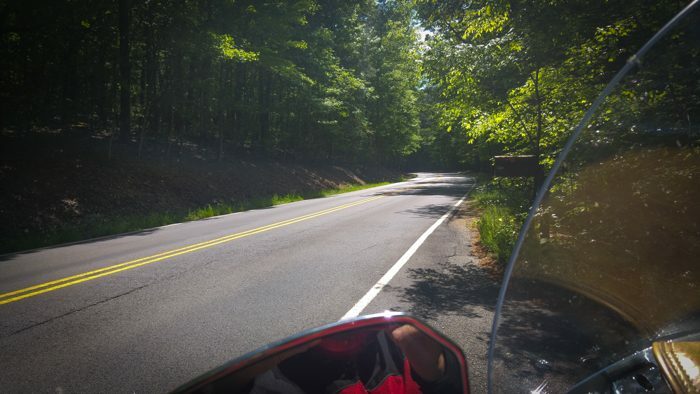 Nearing the northeast corner of Texas, a rider finds himself surrounded by lush pine forest canyons, trees tall enough to render any trees we could envision in Central Texas to weed status. The guys relax after a quick beer at a relative’s house in Palestine before getting back on the highway. 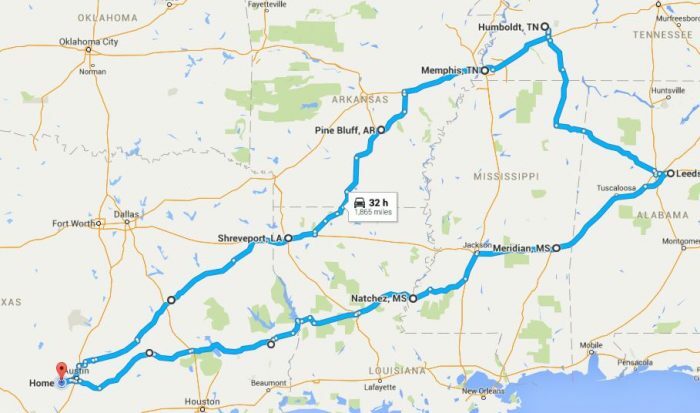 Then it was on through Shreveport, Pine Bluff, Arkansas, and Memphis before pulling into Nathan’s hometown. Nathan and I like to travel impromptu.. i.e., we rarely have a specific day’s destination, nor accommodation in mind until the need arises. That philosophy has served us well through a number of trips. There is always a motel available (if 4 star condition is not a requirement) when we are ready to quit for the day. The trip back through Birmingham, Natchez, MS, and College Station was equally scintillating. I never cease to be amazed at the abrupt change in speed limit AND road conditions between Louisiana and Texas. One of my favorite roads in all of Texas in Highway 28 coming out of Alexandria. 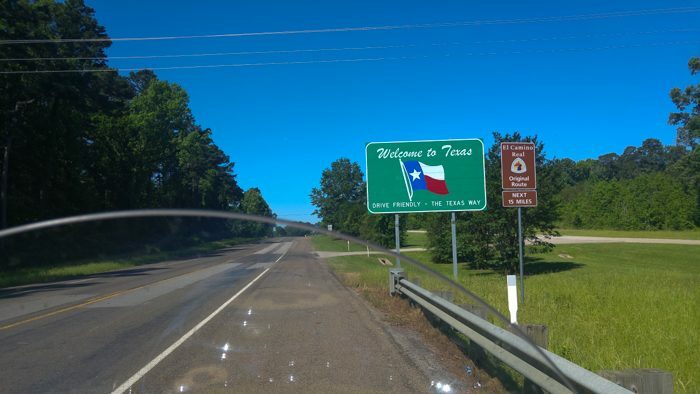 Cross the state border into Texas, and that bumpy, expansion-joint riddled 55mph highway instantly turns to a broad, well paved 2-lane with wide shoulders and a complimentary 75 mph speed limit (plus, don’t forget to add in the Texas 5 mph “fudge factor”.. not so in Louisiana where signs proclaim “Speed limits STRICTLY enforced. . No Leeway”) . Other vehicles are encountered on this road only once every couple of minutes or so, giving one the feeling that this beautiful highway was created and maintained strictly for the biker’s pleasure. I was traveling under a mild, self-imposed time limit, as I had obligations back in Austin. Due to unexpected weather encountered near Natchez, I got to cool my heels for an entire day in a seedy little motel. This compelled me to wrap up the trip on the following day, logging almost 500 miles and an eleven hour day in the saddle. This is a bit beyond my normal comfort limit, but I arrived home safe and sound, if not weary, but ready to start planning the next adventure. Great piece and does a nice job of capturing the trip. Photography was spot on as per usual too. 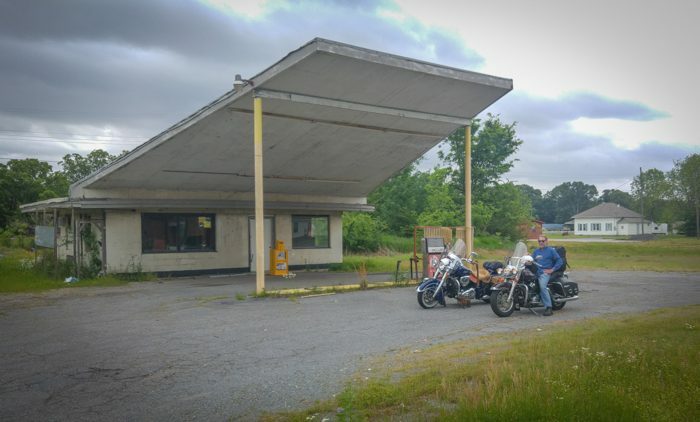 As to why folks ride motorcycles, I guess I have never given it a serious thought (nor much else a serious thought) but I have wondered why folks choose to ride around in a statement less box and look out a window vs. being a part of the ride. I think riding in a car is much like watching a TV vs. going outside and doing something. Life is not a spectator sport but some seem to think it is. 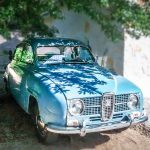 Now riding in a classic car, that is different! Thanks for doing the piece. I enjoyed it and Susie enjoyed it as well.